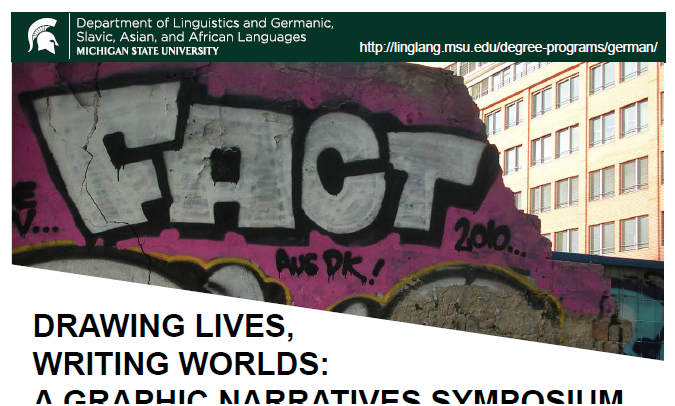 The German Program-sponsored symposium “Drawing Lives, Writing Worlds”, on April 14-15, 2017, explored how graphic narratives – from comics and graphic novels to animation and film – have a unique ability to tell stories across cultures, generations, and languages. The symposium, organized by Profs. 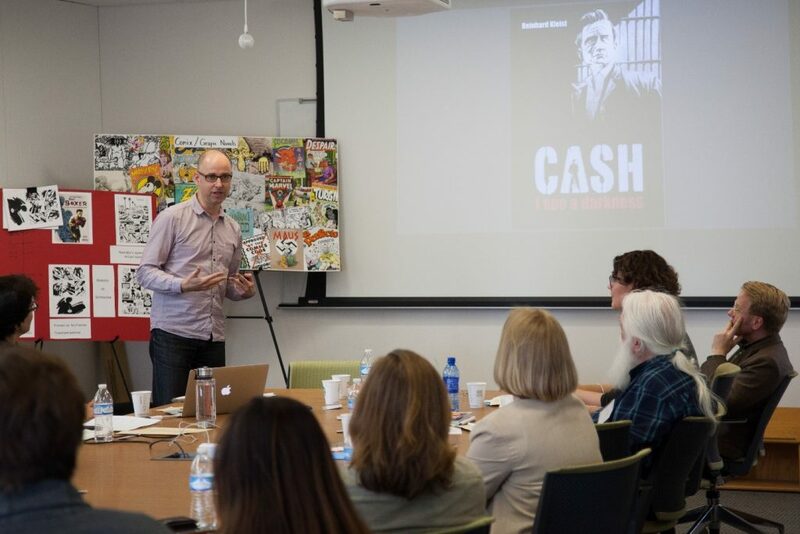 Liz Mittman and Lynn Wolff, brought together several strands of research, teaching, and creative energy among faculty, students, and artists, who presented in multiple formats, such as poster presentations and lightning talks. At the introductory panel, representatives from the College of Arts and Letters, the School of Journalism and MSU Media Sandbox, the MSU Libraries, and the University of Michigan’s Transnational Comics Studies Workshop talked about a wide variety of comics-related projects and resources. A highlight for all participants were the two keynote talks and live drawing demonstrations by two of Germany’s most outstanding graphic artists Reinhard Kleist from Berlin and Line Hoven from Hamburg. The success of this symposium is a good sign for the future of cross-college initiatives in Comics Studies at MSU and collaborative work that is already underway on campus. Faculty in German, Japanese, and French and Francophone Studies are currently developing the Graphic Narratives Network, a multilingual and multinational research endeavor, with the aim of highlighting the MSU Libraries’ Comic Art Collection and increasing MSU’s visibility in the exciting field of text-image studies.